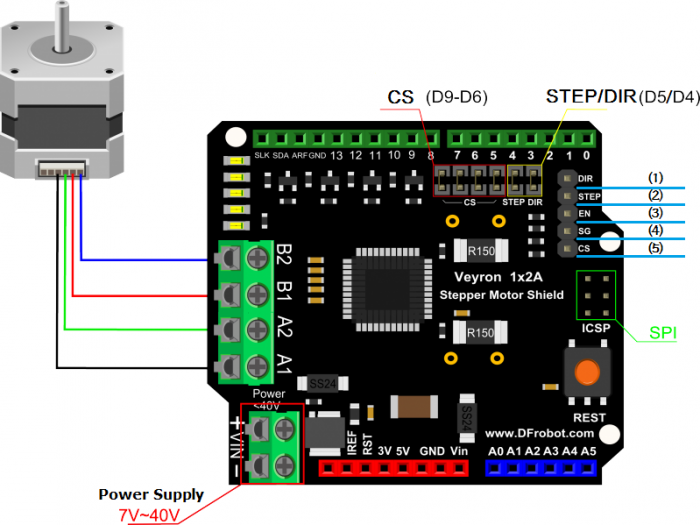 Do you want to do some projects with stepper motors? A pair of automatic curtains? An XY Plotter? A 3D printer? Generally, it's not been easy to find a powerful stepper motor driver for Arduino, but now this has changed! 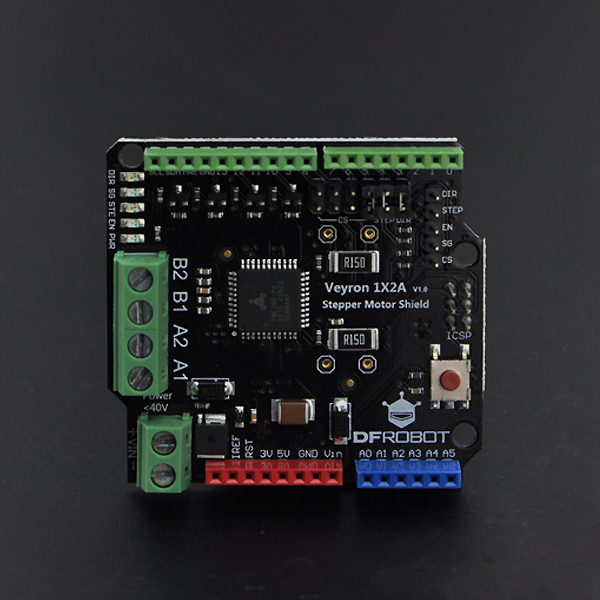 DFRobot presents the TMC260 Stepper Motor Driver Shield. This shield allows your Arduino to easily drive stepper motors (up to 2A per motor coil, 40V max). NOTE: We have already lead out some necessary pins on the chip and use mini jumpers to avoid a jumble of cables. SPI mode: SDOFF bit is set, the STEP/DIR interface is disabled, and DRVCTRL is the interface for specifying the currents through each coil. STEP/DIR mode: SDOFF bit is clear, the STEP/DIR interface is enabled, and DRVCTRL is a configuration register for the STEP/DIR interface. number_of_steps：Number of steps per rotation cs_pin： CS: enable pin dir_pin：Dir: direction pin step_pin：Step: step pin resistor：sense resistor current scaling default value is 15 ohms(or 150 mohms). It can be ignored when you don't need to use that. A stepper motor is a special electromagnetic motor which can convert pulse signals into corresponding angular displacement (or linear displacement). Ordinary motors continuously rotate, but in stepper motors there are two basic states: positioning and revolving. Once there is a pulse input, stepper motor will rotate a certain angle, which we call a "step". The TMC260 driver chip has two different control modes: SPI and STEP/DIR interface. The TMC260 requires configuration parameters and mode bits to be set through the SPI before the motor can be driven. The SPI also allows reading back status values and bits. This interface must be used to initialize parameters and modes necessary to enable driving the motor. This interface may also be used for directly setting the currents flowing through the motor coils, as an alternative to stepping the motor using the STEP and DIR signals, so the motor can be controlled through the SPI interface alone. The STEP/DIR interface is a traditional motor control interface available for adapting existing designs to use TRINAMIC motor drivers. Using only the SPI interface requires slightly more CPU overhead to look up the sine tables and send out new current values for the coils. The SPI (Serial Peripheral Interface) is a bit-serial interface synchronous to a bus clock. For every bit sent from the bus master to the bus slave, another bit is sent simultaneously from the slave to the master. Communication between an SPI master and the TMC260 or TMC261 slave always consists of sending one 20-bit command word and receiving one 20-bit status word. The SPI command rate typically corresponds to the microstep rate at low velocities. At high velocities, the rate may be limited by CPU bandwidth to 10-100 thousand commands per second, so the application may need to change to fullstep resolution. The STEP/DIR interface is enabled by default. On each active edge, the state sampled from the DIR input determines whether to step forward or back. Each step can be a fullstep or a microstep, in which there are 2, 4, 8, 16, 32, 64, 128, or 256 microsteps per fullstep. During microstepping, a step impulse with a low state on DIR increases the microstep counter and a high decreases the counter by an amount controlled by the microstep resolution. An internal table translates the counter value into the sine and cosine values which control the motor current for microstepping. Shopping online from TMC260 Stepper Motor Driver Shield For Arduino or DFRobot Distributor.